Due to lack of sufficient lateritic material to cover the clay dumps, new approach Geotextile –for controlling erosion of the dump surface has been explored few years back. Geotextile are thin, bio-degradable, permeable material made up of coir, cotton, jute, interwoven with nylon filaments. Geotextiles are laid on dump slope before onset of monsoon, which reduces impacts of rain on dump surface thus preventing erosion and also conserving moisture by acting as mulch for the better growth of the plant. Geotextiles decomposes within three years by the time dump is stabilized with vegetation. Till date around 500000 sq.m. Of Geotextiles have been used on dump slopes in all mines. For further stabilazation of the slope, grass seeds are sown on the dump which is later followed by a fully fledged plantation consisting of native species and acacia. Company has established a root trainer nursery at Codli Mine with a capacity to grow 2 lakh saplings per year. The nursery caters to the afforestation requirements of all locations in Goa. Root trainers help to enhance the root growth. Plants grown in the root trainers have a better lateral & tertiary root development with vigorous fibrous root system. In this process, the overall surface area of absorption zone of roots increases and when planted in the field, the seedlings get established faster. 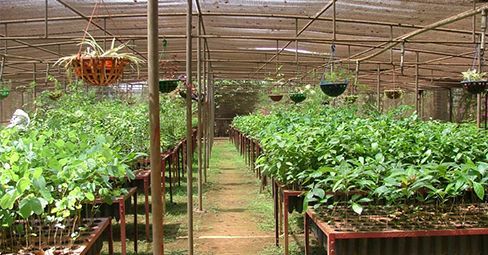 Different native species including local fruits and forest trees are grown and maintained in the nursery. Our results of Mine land reclamation of three decades demonstrated that it is possible to establish a native plant species with a careful planning and soil treatment; however it was a slow process. This problem is overcome with the joint research efforts with NEERI – Nagpur, Department of Biotechnology and Lund University, Sweden. Native Plant species inoculated with bio-fertilizers, developed in root trainers & grown with organic manure with aftercare gets established well on the waste dump. This research has helped in developing the better micro climatic conditions for stabilization of the plants on the hostile dump conditions. 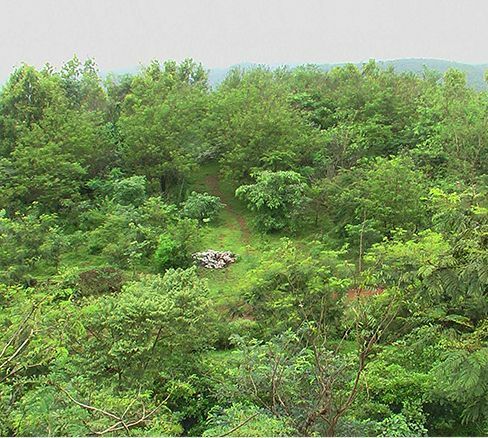 Departmentally this project finding has been replicated at the various sites of the company both with the native species & with horticultural species and has become the integral part of Environment Management plan. Company has conducted research projects also in association with Indian council of Agricultural Research (ICAR), and Goa University. The results of the same are very encouraging and are replicated at other locations. To improve the bio diversity and make value addition to the Sanquelim mine, company has prepared Management plan, which has been approved by Forest department, Govt. of Goa. This plan will include selectively cutting of mature Acacia plants in phased manner and planting of Species native to Western Ghats. This will help to increase & attract the flora and fauna of the region. Under this plan, total area will be utilized for various projects like Butterfly Park, Aromatic garden, Bamboo & Rattan arboretum, Bamboo Pavilion (which will be a center for environmental & social program), Bird watching center etc, .It will be a example for one and all that the exhausted mine if planned properly can be developed in to a ecotourism spot. Exhausted Mine Pit is converted into a Pisciculture pond. Multiplication of fingerlings of Rahu, Mrugal and Carp is encouraged. This fishes can also be used for local consumption. 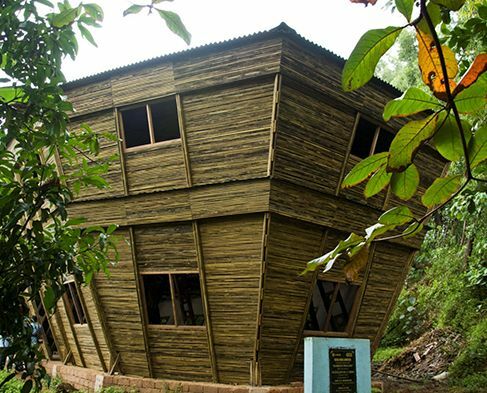 This was done in collaboration with National Institute of Oceanography (NIO). The Mobile water spraying on the roads controls dust during the haulage. All the trucks are provided with the 9-inch plates to prevent the spillage. 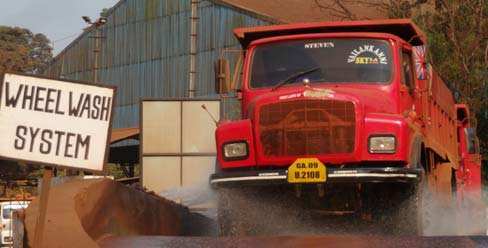 Trucks moving out of the mining premises are covered with tarpaulin & passed through the Wheel Wash system, which contain the silt being carried on the public road. Places where wheel wash system is not feasible are provided with Dry Wheel Wash System (rumbler system). Approach roads are asphalted. The fixed haulage roads on the mines are provided with rain guns to provide a very efficient dust suppression with less consumption of water. Eco –friendly method of Vermi-composting is used to treat Canteen waste, green waste & paper waste. The manure generated in the process is used for the reclamation. On an average around 75 kgs of waste is treated every day in the Vermi-composting unit. Sesa is having its own Environmental Laboratory which is approved by MOEF. The laboratory helps to carryout environment monitoring at all its mining locations thus helping the industry to keep a pollution check.